When I was growing up, we always visited the Drew Cemetery when our family went on “vacation” to visit relatives in our home state of Mississippi. My maternal grandparents & great-grandparents are buried there. We always made a stop to put flowers on their graves, and remember. Visiting the cemetery is really the only memory I have of my grandparents because they passed away when I was 2 and 4 years old. Over the years, Sister was buried there and then Uncle Billy, too. Years later, in 1993, Papa Bill died – my paternal grandfather. He was buried in the Cleveland Cemetery, another small town not far from Drew. I was grown by that time and didn’t make as many trips back to Mississippi to visit, but on those rare occasions, I would visit both cemeteries and put flowers on the graves, and remember. In 2001, a few months before I met Robbie, Grandma passed away. This was the hardest one for me as I was truly Grandma’s favorite and she spoiled me like no one else. She always said I was “like a ray of sunshine” every time I would stop by for a visit. She was buried in the Lehrton Cemetery, which lies between the cities of Drew and Cleveland. Now there are three cemeteries to visit and more graves to put flowers on, and more family to remember. I don’t get back there very often anymore, but this past spring Robbie and I were able to make a two-day stop there when we were traveling for one of those unproductive job interviews. And, of course, we made the rounds of all three cemeteries. It will probably come as no surprise that I always leave behind a trail of yellow flowers. I like to think that maybe somebody will pass by and think that Melissa must have been here recently to leave flowers, and remember. Melissa, it is a beautiful thing to know that you leave a ray of sunshine where ever you go and that you honour members of your family in this way! Yellow flowers like daffodils are such happy things to see and it's lovely that you use them to brighten up their resting places when you visit. Melissa, this is lovely! Another Grandparents story, but one with a poignant, loving twist. 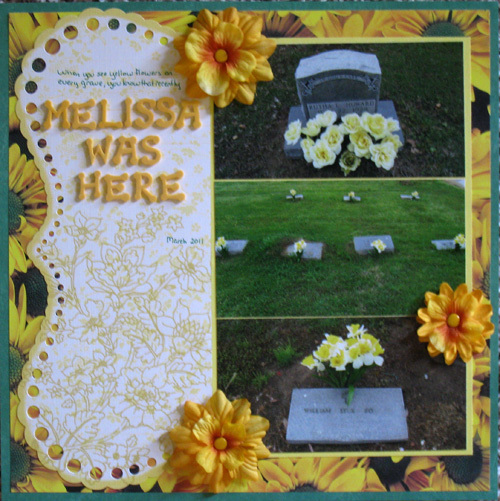 Your layout really has a springtime feel to it too and next time I see some yellow flowers I'll be thinking of you. What a lovely thought...I'll always think of you now when I see yellow flowers! 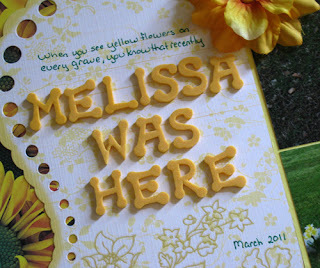 A lovely story,Melissa....and the yellow flowers are such a perfect,bright colour to leave. yellow flowers...kind of like a yellow ribbon... to remember. What a sweet story and love your "I was here" signature! Lovely story and the yellow flowers will definitely bring joy to somebody! My mum and I both love visiting cemeteries, especially old ones. What a lovely story. I'm a lover of yellow flowers too and always like to have a jug of daffodils on my kitchen windowsill in the Spring. You are a ray of sunshine that brings yellow flowers - so good of you to remember. I can't visit the cemetaries as they are just too far away, so I buy flowers here to remind me and my favourites are always yellow. Thanks for the reminder - and the tears. It sounds as if your visits to the cemeteries are, as they should be, more sweet than bitter. And it's nice that you have your own special way of remembering your loved ones. What a touching story. My grandparents have all passed away, but were all cremated, and there ashes all scattered so I have nowhere to leave flowers. I think it is lovely to be able to go and place flowers somewhere and go and think of someone special. Love the title you came up with for what could be a maudlin scrapbook page! A lovely story. We visit my parent's graves when we go to L.A. This Christmas season, my daughter wants to really decorate them. And I'm looking forward to that. my grandparents are all buried in cheltenham and my parents went last weekend to do their graves. i have a strange attraction to cemeteries, especially the older graves wondering what the lives of those people were like. Having studied some of family history it was very sad for me to discover my great grandparents were buried in a paupers grave which means that others are buried with them and they have no headstone. A beautiful story Melissa - what a wonderful tradition too. This is just lovely. I do just the same thing! I am going to take your idea, if I may and write about my cemetery story! What a lovely and touching story Melissa.